Join Avon, the company for women, in helping break the cycle of domestic abuse through their "Speak Out" campaign. Domestic violence is a devastating reality that affects Filipino homes, yet it's not a topic that is easily brought up in casual conversation. It goes beyond physical abuse, and can even affect young people who are forced to suffer in silence. But this month, one company is taking a stand and encouraging everyone to lend a voice to the victims of abuse. Avon, the company for women, launches the Speak Out Public Service Ad Competition this April to call attention to this critical issue. As part of the company's Speak Out Against Domestic Violence campaign, the contest invites individuals aged 18-25 to depict the realities of domestic violence in the form of print and TV ads. To join, form a group of three to five people and log on to the Avon website to download and fill in the official application form, which must be submitted along with the initial requirements. All entries and forms must be submitted via email to avonspeakout@gmail.com on or before May 9. Besides knowing that they are making a concrete contribution to the fight against domestic violence, the top three winners will also receive cash prizes of P75,000, P50,000, and P25,000. So if you've got the creativity and passion to raise awareness about domestic violence, we encourage you to step up and harness your talents with Avon. You could help save the lives of countless victims by speaking out on their behalf. 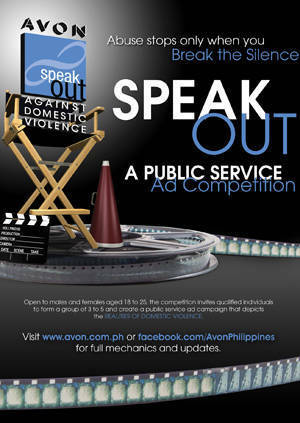 For more information on Avon Speak Out Against Domestic Violence and to get the full mechanics and updates on the Public Service Ad Competition, visit their Facebook and Twitter pages, and the official Avon website.